Who is Harvard’s biggest rival? Yale, right? Nope, not anymore. Yes, The Game is still a big deal, but what’s true on the football field is no longer true for undergraduate education. Yale, founded over 300 years ago, has been supplanted as the Crimson’s main competition in the academic world by an institution less than half as old—Stanford. The numbers do not lie. In 2017 Stanford accepted 4.7% of 44,073 applicants for undergraduate admission. Harvard accepted 5.2% of 39,506. That makes the West Coast institution both more popular and more exclusive. Of the students who were accepted by both colleges, an estimated 43% pick Stanford over Harvard. That’s real competition (and a higher number than the estimated 39% who pick Yale over Harvard). I’ve lived in Palo Alto, Stanford’s hometown, since I was a boy. Currently, though, I am hanging out in Cambridge as a resident scholar in Mather House. From what I’ve gleaned talking to applicants and students in both locales, Stanford’s the sexier choice. It’s smack-dab in the midst of Silicon Valley and has a climate without compare. A friend of mine who teaches at Stanford calls it “a tech incubator with dorms.” He counted over 160 courses there with some variant of “entrepreneur” or “innovation” in their title. Its most celebrated grads are tech billionaires like Peter Thiel, co-founder of PayPal and early investor in Facebook, Reid Hoffman, founder of LinkedIn, and Reed Hastings, founder of Netflix. Stanford is to Silicon Valley what West Point is to the Army. Stanford’s recent ascendance in technology has not gone unanswered by our fair institution. 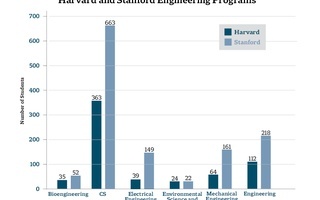 Harvard is investing big-time in its School of Engineering and Applied Sciences. Stanford-style incubation? 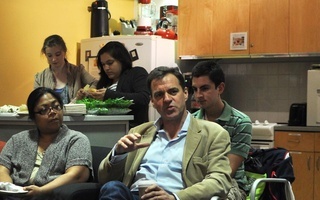 Harvard has set up its Innovation Lab across the river to foster tech startups. Undergraduates are concentrating more than ever in fields like computer science, applied math, and economics. Back during the Cold War, I served on the staff of the Senate Intelligence Committee. It’s said that during those days, as the Soviet KGB and American CIA played “Spy vs. Spy” around the world, the two agencies became more and more alike. Is that what Harvard is doing, becoming more like its chief competitor? What does this mean for Harvard? That even while continuing to invest in STEM, it should reverse the slide in the study of literature, philosophy, foreign cultures, religion, history, and the humanities and social sciences generally. Today some humanities departments have more tenured faculty than concentrators. So, I offer this advice to Harvard’s next president. Let Stanford do what it may. Harvard should remain Harvard, a place where knowledge is valued primarily for its own sake, not for the new startups it spawns. Keith Raffel ’72 was the founder of UpShot Corporation, a Silicon Valley pioneer in cloud computing solutions, and is currently the writer-in-residence of Mather House. We long ago realized that the New World was no longer new. But you learn very quickly here that today’s frontier is whatever you make of it.